Silent Hill (also known as Silent Hill 1) is the first installment in the Silent Hill series, a highly successful franchise of adventure/survival horror video games. 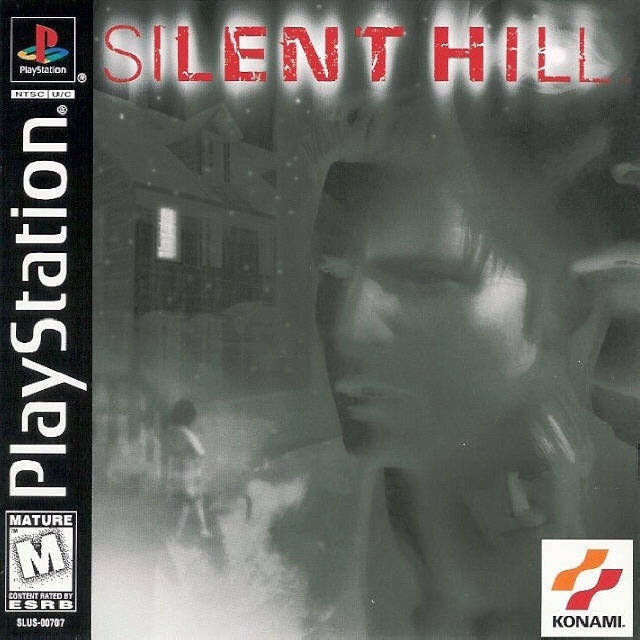 Silent Hill was developed by Team Silent and published by Konami. It was released for the Sony PlayStation in North America on January 31, 1999 and has thus far spawned many sequels, a series of graphic novels, a motion picture and more. Silent Hill 3 is a sequel set 17 years after the game, while Silent Hill: Origins is a prequel set 7 years before the game. Silent Hill: Shattered Memories is a non-canon re-imagining of the game, sharing the game’s original premise. The game tells the story of Harry Mason, a 32-year-old writer who takes his adopted daughter, Cheryl Mason, to a vacation in the resort area of Silent Hill, a small United States town known for its very peaceful ambience. While driving on the outskirts of the town, Harry sees the shape of a young girl walking across the road. Harry swerves his car to avoid hitting her and is knocked unconscious by the resulting car crash. Harry wakes up later to find that Cheryl has disappeared, and he is forced to venture into the fog-enshrouded town, oblivious to the horrors he will experience. The story of Silent Hill takes place in 1983. After crashing his vehicle just outside the town of Silent Hill, Harry regains consciousness to find Cheryl has disappeared. Harry leaves the area to look around, and sees Cheryl running away and immediately hurries to follow her. Chasing her through the streets of Silent Hill, he finds himself running down a small residential street and into a dark alley. The sky suddenly turns dark, and when he lights the area with a lighter, he finds that his entire environment has changed. The road pavement has been replaced by rusted metal grating and platforms, and the walls are a dark, grimy series of mesh and chain link fences. Everything is covered in rust and blood, tipped with barbed wire, and the shapes of hanging bodies are discernible behind the mesh. The sounds of industrial clanking and grinding metal form a constant cacophony of ambient noise. With nowhere to go, Harry follows the alley and finds the disturbing body of a mutilated corpse hanging on a fence before him. Moments later he is attacked by small, child-like monsters. Despite his best efforts, Harry is eventually overwhelmed and “killed”. He wakes up in a deserted diner called Cafe 5to2. It is here that an officer named Cybil Bennett appears. After a brief conversation, Cybil provides him with a handgun and the two split up. Harry, having equipped himself with a flashlight and radio that he found in the cafe, soon encounters other monsters on the fog-enshrouded streets. He quickly discovers the radio’s usefulness when it emits intensifying static as monsters grow closer. Following a clue left by his daughter, Harry eventually finds his way to Midwich Elementary School. From his initial inspection, the school itself is long since abandoned. Instead of students and teachers, Harry finds many Grey Children/Mumblers. Harry works his way around, eventually unlocking the clock tower in the school’s courtyard. Upon reaching the other side of the facility across the courtyard, he is shocked to find the world has once again shifted into the Otherworld. Again, the already dwindling light is reduced to nothing more than what Harry’s flashlight can produce, and the surfaces have all undergone a horrific shift back to the metal grating and uneven platforms. In the Otherworld school, Harry travels to the boiler room. Inside, light is cast by a flaming corpse and it illuminates a creature known as the Split Head – a large lizard with its head split in half. With its defeat, everything turns to darkness, and then the light returns to reveal an ordinary boiler room. A young woman, Alessa Gillespie, is leaning against the boiler. She turns to Harry and disappears into thin air. Harry, confused, leaves the school. He hears a church bell ringing in the distance and heads to the Balkan Church, where he sees an old woman praying at an altar. She turns to meet Harry, and in a conversation that Harry has difficulty understanding, the old woman reveals herself to be Dahlia Gillespie. She gives Harry a mystical item called the Flauros and tells him to make haste to the hospital. Before Harry can ask any questions, Dahlia leaves and Harry exits the church. He crosses a bridge that leads to Central Silent Hill. Harry arrives at Alchemilla Hospital, where he encounters Michael Kaufmann, a doctor who is as bewildered as Harry about the current circumstances. Shortly after this meeting, Harry endures another shift to the Otherworld, transforming the medical facility into the Otherworld’s twisted version of the hospital, infested with monstrous nurses. Along the way he also meets Lisa Garland, a terrified nurse. Though she knows much about the town and its history, he is unable to get answers before he is transported back to the normal world, where Dahlia reappears and tells him that the “Mark of Samael”, a strange symbol he has seen in various locations, must not be completed, lest the darkness devour the whole town. Meeting up with Cybil, who has seen a girl out on the lake, the pair find a hidden altar in an antiques store, but Harry disappears out of sight of Cybil, much to her confusion. Harry, meanwhile, finds himself back in the hospital with Lisa, who gives him directions to the lake, but also tells Harry she feels she’s “not supposed to leave”. On the way to the lake, Harry crosses a waterway and enters the resort area. The player may determine Kaufmann’s fate – and the game’s ending – by choosing to assist him in Annie’s Bar. Soon after, the Otherworld nightmare begins to take over the town completely. Regrouping with Cybil, and deciding to stop the mark’s completion at Dahlia’s desperate request, Harry heads to the lighthouse and Cybil heads to the Lakeside Amusement Park. As a cutscene shows Cybil attacked by an unknown assailant, Harry once more sees Alessa, and the symbol, at the top of the lighthouse, before heading to the amusement park himself. On the amusement park’s carousel, Cybil appears, possessed by a parasite. The player may choose to save or kill Cybil, once again affecting the game’s ending. With Alessa appearing once more, Harry unwittingly uses the Flauros to trap her. Dahlia appears, revealing that she manipulated him into trapping her, as he was the only one who would be able to get close to her, and that Alessa is in fact her daughter. With Alessa’s powers out of control, Harry awakens to find himself back in the distorted world resembling the hospital, simply known as “Nowhere”. He finds Lisa, who has come to realize that she is no different from the other nurses. She begins to transform in front of a horrified Harry, who flees when she approaches him, though he is clearly sympathetic. Lisa’s diary, left in the room, explains that she was the nurse who attended to Alessa in return for a drug she was addicted to, White Claudia, which Kaufmann supplied. In Nowhere, Harry sees a flashback of a meeting between Dahlia, Kaufmann and two cult doctors. He soon finds Dahlia and Kaufmann (and Cybil if he saved her earlier), as well as a figure in a wheelchair, wrapped in bandages – Cheryl. Alessa kneels nearby. Both the flashback and Dahlia’s words explain that Dahlia sacrificed her daughter to fire seven years ago in an attempt to nurture and bring about the birth of the cult’s God that resides inside her. In doing so, Alessa’s soul was split in two by hatred, and the God could not be born, so a spell was cast by Dahlia that would ultimately draw the other half of the soul back to Alessa. The other half of the soul manifested itself as Cheryl, whom Harry and his wife found as a baby on the road outside of Silent Hill and subsequently adopted. In the present, Alessa, sensing Cheryl’s return through an increase in her power, manifested herself in the town to place the marks Harry has seen in an attempt to keep the God at bay. With Alessa’s plan defeated and the two halves of her soul now back together, the God creature begins to manifest itself. Kaufmann appears and throws a vial of Aglaophotis at the God. Depending on the actions of the player, the God appears as either Incubus or Incubator. Both forms kill Dahlia instantly, before turning its attention to Harry, who ultimately defeats it. Cybil tries to shoot Dahlia, but fails and Alessa and Cheryl merge, becoming the Incubator. Kaufmann then appears, shooting Dahlia and throwing the Aglaophotis at the Incubator. When hit with the liquid, the Incubator falls to the ground screaming as Incubus emerges from her back. The Incubus kills Dahlia. Harry then fights and defeats the Incubus, and the Incubator gives him a baby (who is revealed to be Heather Mason in Silent Hill 3) and shows him the escape route. Harry, Cybil and Kaufmann try to escape, but a blood-covered Lisa Garland appears and drags Kaufmann with her into the abyss. Harry and Cybil continue their escape; however, the Otherworld is collapsing too quickly for them to make it on their own, so the Incubator uses the last of her power to stop the world’s destruction in order for them to escape. The Incubator is then consumed by the flames and Cybil and Harry escape together with the baby. The song for this ending is Tears Of…. Alessa and Cheryl merge, becoming the Incubator, but Kaufmann appears, shooting Dahlia and throwing the Aglaophotis at the Incubator. When hit with the liquid, the Incubator falls screaming to the ground as the Incubus emerges from her back. The Incubus kills Dahlia. Harry defeats the Incubus and the Incubator gives him a baby (who is revealed to be Heather in Silent Hill 3) and shows him the escape route. As Harry escapes, Kaufmann tries to follow him but is stopped by Lisa. The Incubator is consumed by the flames. The Book of Lost Memories states that this is the “orthodox ending” connected to the third game. The song for this ending is Killing Time. Alessa and Cheryl merge, becoming the Incubator, and kill Dahlia. Cybil then appears and tries to kill Dahlia, but fails. Harry then battles Incubator who, after defeat, thanks Harry for killing her. Harry then collapses in sorrow over the loss of his daughter. Cybil walks over to Harry, smacks him out of his grief, and tells him to go as the Otherworld collapses around them. The song for this ending is She. Alessa and Cheryl merge, becoming the Incubator, and kill Dahlia. Harry then battles the Incubator who, after defeat, thanks Harry and says goodbye in Cheryl’s voice. Harry collapses in sorrow over the loss of his daughter, and the player is then shown an image of him bleeding from his head, unconscious in his car, which suggests that everything that happened in Silent Hill was just a dream Harry had before he died. It can be assumed that Harry died of blood loss or head trauma, though it is unknown. This ending is ironic because at one point in the game, Harry wonders whether everything that is happening to him is just a dream that he is having in a hospital after a car accident. The song for this ending is Esperándote. When Harry uses the Channeling Stone for the 5th time on top of the lighthouse a group of UFOs is seen in the sky. As the UFOs land the cutscene changes style to a roughly animated picture show. Harry tries to ask the aliens if they have seen his daughter, but is shot down and brought into their space-ship. The UFOs take off and the credits roll.